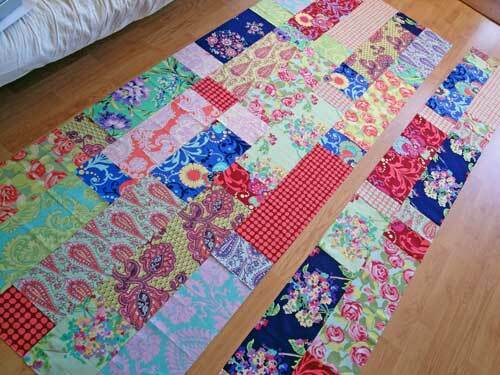 Over the weekend I finally began working on the quilt back for my Fanciful Flowers quilt. After thinking about a bunch of different options, I decided to piece the back and use up a bunch of fat quarters. The backing uses what remains of my Amy Butler fabric and some random floral fabrics that I've had for way too long. The front took a long time to put together, so it's only fitting that the back should take a while too. The only slight downer is that I miss my floor and being able to walk wherever. I had just finished another project and my floor was clean for all of 5 minutes before I started laying out these fabrics.